Product of the Year awards and entries will be on display at the 2017 SGIA Expo. 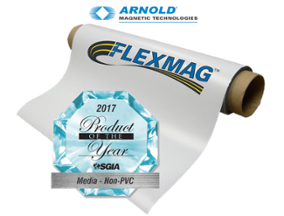 Marietta, Ohio — Flexmag Industries (SGIA Expo Booth 2401) is proud to announce its Flexcoat-EZ™ has received the Specialty Graphic Imaging Association’s (SGIA) 2017 Product of the Year Award in the Media – Non-PVC category. The coveted Product of the Year jewel awards will be presented in a special ceremony Monday, October 9, in conjunction with the 2017 SGIA Expo, and exhibitors will be able to display them in their booths. For over 35 years, Flexmag has been producing the highest quality flexible magnetic sheet serving the specialty advertising industry. Through product process innovations and responsive service, Flexmag has grown to become the leading worldwide source, each year producing millions of feet of product. For information on Flexcoat-EZ™, contact Customer Service at 800-543-4426.